A random plot generator must be top of any novelist's Christmas wish list! It sounds like the perfect answer to writer's block. These both work in the same way, with random prompts to kickstart your own creativity. 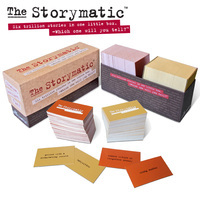 The Storymatic has written prompts, and Rory's Story Cubes have images which you can interpret for yourself, and that interpretation is part of your creativity. So, if an image of a clock turns up, what does that mean? Time passing? Secret from the past? Missed connection? Deciding what the image means in your own story is half of the fun. The best way of conjuring up plot ideas is to use your own brain. Make sure to live a writer's life, in which you're always on duty and always open to ideas. You're always asking 'What if ...' and coming up with new plot ideas. To my mind, the perfect way to get plot ideas is a combination of your own brain and EFT - I invite you to check it out. The good news is that the more you practise using your own creativity, the more you're training your mind to think like this, and so the more easily the ideas come. In truth, I now have more ideas than I could possibly write in a lifetime, because my mind is now attuned to thinking of plot possibilities all the time! Having said all that, here's a selection of the better plot generators that I've found on the internet for you. I did exclude the rather sillier ones, the ones which came up with suggestions like this: Chiana, Supreme Protector of the Federation of Green Dustbins, pours body lotion all over Weyoun. Basically, I've ploughed through them all so you don't have to! Even the ones I've chosen mightn't suit your situation exactly (e.g. one is for fantasy books, another for children's books), but use your imagination in each case to adjust the suggestions for your own genre. This plot generator, by the famous Teresa Nielsen Hayden, is based around the fantasy genre. This one just gives you single-line suggestions rather than whole plots, but is interesting. This is very specific - Christian fantasy. But there are lots of good ideas in it for everybody. Note that in Firefox the plot isn't highlighted - it's the paragraph above the 'Tell Me Another Story!' link. This one just scraped in on the Silliness Scale. A bit of fun though, check it out.